If my twenties were all about figuring out who I am, trying on different personas to see which one would stick, my thirties have been about coming to terms with the person that I’ve become, both the good and the bad. More importantly, I’ve had these a-ha moments where I recognize emerging patterns in my behavior. I’ve never been very good at recognizing patterns and relationships. If you point them out to me, I will make the connection but tell me to look without giving me a clue and I come up empty-handed. Is it any wonder that I’m drawn to self-help books? I don’t know how Gretchen Rubin would feel about being labeled “self-help” because the genre does kind of have a weirdo, fringe reputation but her new book, Better than Before, has been a kind of revelation for me. I needed someone to do the pattern-finding legwork for me so I could just say, “hey, that’s me!” and go from there. That’s exactly what Gretchen does in this book. First, she describes what she calls the Four Tendencies, her framework for helping people figure out the best way to break or start a habit. The Tendencies are like personalities. There might be overlap between them but for the most part, you’ll find yourself relating to one in particular. From there, the book walks you through different strategies for making the changes you want to see in yourself, in that classic Gretchen way of using herself and her friends as guinea pigs, and of course, copious amounts of research, evident from her nearly twenty pages of notes at the end of the book. If you are looking for answers, you will find them here. At least, that is how I felt while reading this book. There are many, many books out there with advice about habits, but they tend to take a One-Size-Fits-All approach. In Better than Before, Gretchen offers strategies that speak to specific Tendencies. Right away, I understood that I am what Gretchen calls an “Obliger,” someone who meets outer expectations but resists the inner ones. And it’s true—I hate to let people down and I am motivated by external accountability. So, if I want to adopt or shed a habit, I need a form accountability that comes from outside of myself. I am a major procrastinator. For example, in school, I was motivated to get good grades. At work, I am motivated by positive feedback and feeling useful. So, these motivations spur me out of procrastination. Another way that I break free of procrastination is to put potential distractions out of sight, out of reach and out of mind. This makes me an “Abstainer.” I can never do just a little of something, I can never just eat one chip or read just one blog post. It’s all or nothing with me, and here’s the thing about Better Than Before. Instead of being told to change who I am, Gretchen says to accept who you are and change your environment to suit that. So, I don’t buy the chips and I leave my phone or computer in a different room when I sit down to read a book. Someday, my kids will learn that we never have Oreos in the house not because they’re unhealthy and junky (I mean, yes they are…) but because mommy can’t control herself around cookies. Sorry, kids! But make no mistake. Even with this blueprint that maps everything out for you, the job is still not easy. Since finishing this book, I’ve turned Gretchen’s words over and over in my mind, and I’ve gone back to the book to re-read the sections that speak to me the most but making the leap to action is a different story. Gretchen is good, but not that good. 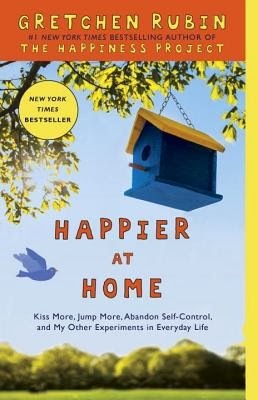 Fans of The Happiness Project and Happier at Home won’t be disappointed by this book, and readers looking for a different, more intuitive and gentler way to change their habits will also get a lot from Better Than Before. I don’t know if it was an accident that January’s book dovetails so nicely with the season’s tendency to create resolutions and vow to begin anew but it was certainly an apropos read as I head into 2014 with a vow to begin some serious introspection. I’ve always admired my friend Caitlin’s ability to observe and analyze her behaviors as they relate to her husband and children, and I strive for that same level of inwardness this year, in the name of strengthening my relationship with my husband and creating a stronger family unit. I’ve started working on my Amazing Life 2014 workbook (more on that soon! ), which pairs quite nicely with the ideas I’ve garnered from Happier at Home, by Gretchen Rubin. The changes of season are the true markers in the year where we bow to the inclination to refresh our habits, our places, ourselves. September, a new school year, when nights get cooler and the days begin to shorten. November, when true winter starts to set in, engulfing us in darkness earlier and earlier. March, when it is still cool but the wind is warmer, and green starts to show up again. June, when summer seems to stretch endlessly ahead of us and we live our life outdoors, sun up to sundown. 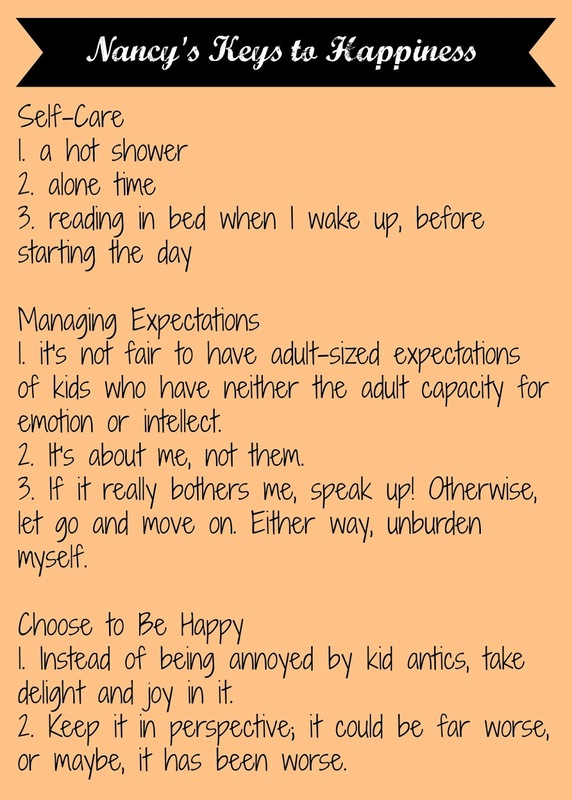 At these points in the year, I will revisit my happiness goals. So, 2014 is the new page upon which I write. This year, I aim for no lofty resolutions but a journey inward. In this, my 35th year, I hope to learn more about myself, to become more aware of what makes me tick, what makes me happy and to strive for general self-acceptance. This post was inspired by Happier at Home by Gretchen Rubin, in which she embarks on a 9 month pursuit of happiness. Join From Left to Write on January 6 as we discuss Happier at Home. You can also chat live with Gretchen Rubin on January 7 on Facebook! As a member, I received a copy of the book for review purposes.